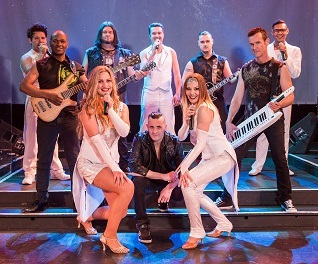 Rock Royalty, currently running at The Barnyard Theatre at Gateway, pays tribute to the kings and queens of rock. It offers a vibrant tribute to the androgynous, flamboyant and outrageous music legends that promises audiences a musical experience as close to the real thing as possible. A 10-piece cast brings to life early rock legends such as Chuck Berry and Little Richard; classic rock icons like Deep Purple, Led Zeppelin, AC/DC and Queen; and 80’s rockers including Def Leppard, Bon Jovi and Journey. Also in the line-up are hits of rock divas such as Janis Joplin, Pink and Tina Turner; plus music from formidable performers such as Alice Cooper, Mick Jagger and Meatloaf, and the ever-green ones such as Elton John, Freddie Mercury and James Brown. A wide array of hits include Stairway To Heaven, Satisfaction, Don’t Let The Sun Go Down On Me, Raise Your Glass, We Built This City, Don’t Stop Believing, Bat Out Of Hell and We Will Rock You. Rock Royalty is an extravaganza where personality, stage presence, over-the-top costumes and downright diva behaviour makes for a high energy performance. The blue-blooded cast is made up of Ray Oberholzer, Riyaan Cornelius, Kyle Matthews, Yvette Barnard and Sjanel Vosloo on vocals, as well as James Dobson on keyboards and vocals. They are joined by Jared Gunston and Shelds von Grimm on guitar, Bongani Sokhela on bass guitar and Brian Fraser on drums. For further information e-mail gateway@barnyardtheatres.co.za or visit www.facebook.com/gatewaybarnyard.